I don’t usually write about restaurants on Mexico Retold, (apart from that one time I had the amazing Torta de Chile en Nogada), but last weekend I tried a new restaurant in Oaxaca and it was so bloomin’ good that I just had to share. There are a lot of restaurants in Oaxaca. Oaxacan food is amazing! There are also a lot of places that offer a kind of contemporary take on Oaxacan fare, but when I tried the food at Tobaziche, I felt like I was trying something totally new. Don’t get me wrong, the food is Oaxacan, with many locally sourced ingredients, but the menu has been designed in such a way that I felt excited and delighted with every mouthful. Think tlayuda de mariscos, nopales con chapulines and tiny dried shrimp, think possibly “the best ceviche you have ever tasted” (to quote my partner). The food is not the only thing that is great about Tobaziche. The interior, the whole design and, dare I say it, the ‘concept’ is so fresh. Clean edges, white walls, modern wood benches, interesting plant features and fantastic murals give the place an exciting but relaxed and cosy feel. The food menus double as place mats and the drinks menu is like a little newspaper of goodies. Everything about the design feels well thought out. The service is also good, which is something I am picky about! David the manager used to work at El Olivo and is a partner in Gourmand and his friendly but professional manner attests to that. Although strangely, the prices rose from one week to the next, I think they are still very reasonable for the quality, the ambiance, the service and the location. 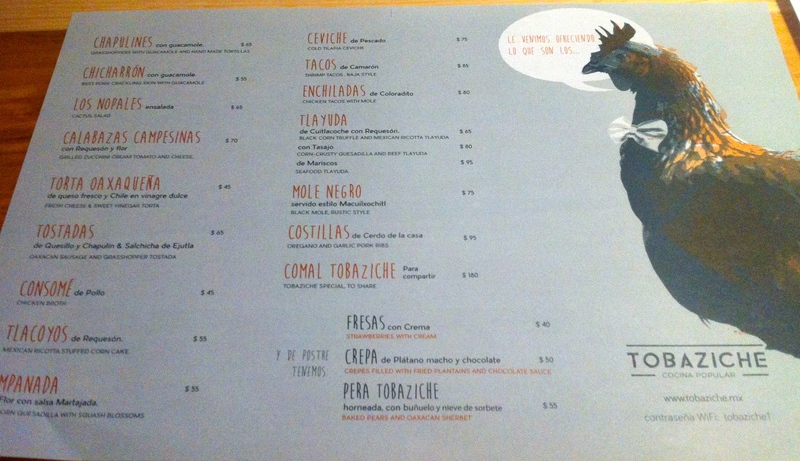 My top tip: Try the Calabazas Campesinas …Mind blowingly good! I ate here and found the food very mediocre, and the ambiance odd with the long wooden tables that must be shared and uncomfortable wooden chairs. I made the menú. It is definetelly controversial. It is good we have very different options in Oaxaca city , and different likes or preferences. But I think is is not mediocre , other wise Mexican en Oaxacan food would be such. It is simple ,tasty ,popular , nutritious , and must important not pretentious . Exactly what we wanted. Tasty ,simple and non formal popular food . And also the way we eat in my country. It is good we have several different restaurant options in Oaxaca city.